Welcome to the Digital and ICT strategic planning framework. 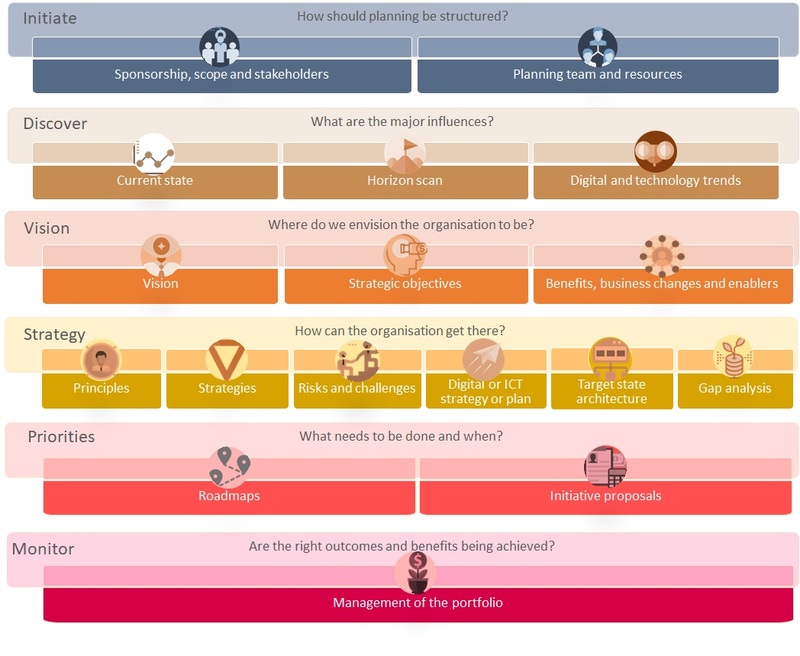 The digital transformation of services is a goal of many agencies, and in a world of limited resources, digital and ICT strategic planning can help agencies to understand and prioritise their technology needs to the business direction. This framework has been developed to complement the ICT Resources Strategic Planning Policy (IS2). It also introduces new planning techniques to define future digital and ICT business opportunities and strengthen the development of digital and ICT strategic plans, investment proposals and associated governance practices. This framework introduces tools, resources and planning concepts to enable experienced strategic planners to build on their existing knowledge. This framework is not a step by step ‘how to plan’ guide, and will not be suitable for people who are new to strategic planning.